Over the last several years, the light heavyweight division has ceded its position as the glamour division in the UFC. For quite some time, the 205-pound ranks played host to many of the biggest names in the sport and could be counted on to continually produce compelling, competitive entertaining matchups. But as Jon Jones ascended to the top of the division, several of those established, iconic figures who made the weight class what it was started to slow down and other weight classes began to gain traction. More recently, it has become fashionable to bemoan the current state of the division – to reminisce about “the good old days” – but reports of the demise of the 205-pound weight class have been greatly exaggerated and this weekend’s co-main event helps illustrate that. Over the last 11 months, Jan Blachowicz has established himself as a fresh contender in the light heavyweight division. After debuting with a first-round stoppage win over Ilir Latifi where he hit “The Sledgehammer” with a body kick that sounded like Giancarlo Stanton connecting on a 500-foot home run, the former KSW star struggled, going 1-4 in his next five fights. Three of those setbacks came against Top 10 opponents and the fourth was a shaky decision, but regardless of the context or qualifiers, it appeared as if Blachowicz was never going to emerge as the contender most forecasted him to become when he signed with the UFC in early 2014. But after collecting an impressive second-round submission win over Devin Clark last October at home in Poland, Blachowicz has posted back-to-back strong decision wins, outworking Jared Cannonier and Jimi Manuwa in consecutive appearances to vault into the Top 5 in the divisional rankings and emerge as an intriguing new name with the potential to challenge for the light heavyweight title. 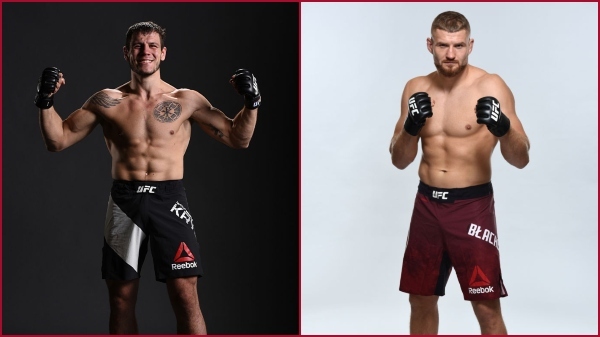 This weekend, the Polish veteran welcomes Nikita Krylov back to the Octagon for the first time in nearly two years. One of the knocks on the division during these last few years has been the lack of young, emerging talent working its way up the ranks and Krylov asking for and being granted his release following his loss to Misha Cirkunov at UFC 206 only exacerbated things. MORE MOSCOW: Jimmy Smith Preview | Fight by Fight | Watch only on FIGHT PASS! But this weekend, “The Miner” makes his return, sliding into the co-main event opposite Blachowicz on a four-fight winning streak and looking every bit the part of the young, emerging talent fans crave. Because he made his promotional debut a little over five years ago and has already made 29 appearances in his career, it’s easy for people to forget that Krylov is only 26 years old and just now entering his athletic prime. Additionally, while some will quickly point out that he suffered losses to the two Top 15 opponents he faced during his first UFC run – Ovince Saint Preux and Cirkunov – there have been several future titleholders who have encountered difficulties inside the Octagon, only to learn from those mistakes, regroup and go on to achieve greatness. While Krylov may not have championship potential, it certainly looks like the returning Ukrainian talent could very well be coming into his own as he comes back to compete on the biggest stage in the sport again. He went 4-0 after exiting the Octagon, earning all four victories by stoppage, including consecutive first-round knockout wins over experienced veterans Emanuel Newton and Fabio Maldonado. Now he’s back and slotted into a crucial contest in the light heavyweight division straight away, and how this one plays out will have an immediate impact on how things shake out in the 205-pound ranks in 2019. This is a perfect pairing to determine whether Krylov has indeed taken another step forward in his development or simply got the better of recognizable names during his four-fight break from competing in the Octagon. Blachowicz is a technical kickboxer with an underrated submission game. The 35-year-old veteran showed in his rematch with Manuwa that he has found an approach that works for him inside the Octagon and is able to dictate the terms of engagement, using his movement to stay out of trouble and mixing up his offensive attacks just enough to keep opponents guessing. He is experienced and brimming with confidence, finally having cracked the Top 5 in the division. He’s clearly on the short list of potential challengers once the title chase gets rolling again and picking up a fourth straight victory over the returning Krylov would only further bolster his candidacy. But that’s what makes this a tremendous opportunity for Krylov too. Rather than returning against an experienced opponent stationed outside of the Top 10 or Top 15, he’s getting a chance to make an instant impact by taking on the fourth-ranked fighter in the division. And regardless of how you feel about the victories he posted outside of the Octagon, coming back and beating Blachowicz would be an achievement that cannot be overlooked. As much as the conversation has been about the light heavyweight division taking a step back, the reality is that other weight classes have just taken several steps forward, drawing level or moving ahead of the still compelling, still entertaining 205-pound weight class.